After the tenuous deal struck in Geneva aimed at de-escalating the Ukrainian crisis, Secretary of State John Kerry cautiously called it "a good day's work." Whether it will turn out to be more than that depends of course on Moscow's willingness to follow through on reducing both covert and open intimidation by pro-Russian agents in eastern Ukraine. President Obama candidly observed that his administration "can't count on" the Russians to comply with all the terms of the deal voluntarily, and must be prepared to respond with further economic sanctions if they don't. The terms include return of all illegally seized Ukrainian government buildings along with amnesty to protesters not involved in capital crimes, and a Ukrainian presidential election next month. Obama reiterated that the U.S. is contemplating no military involvement, an assurance that may soothe concerns of Americans weary of foreign wars. But no doubt this commitment will also invite allegations from hard-liners at home that the president continues to display weakness that only emboldens Vladimir Putin to pursue his supposed dreams of restoring the old Soviet Union. Obama's posture, however, is in keeping with his own long-range aspirations and strategy to restore diplomacy as the preferred prime means of resolving conflicts beyond this country's borders. He remains committed to collective military and other actions among allies and the world community, including the United Nations. This determination frustrates American neoconservatives and serves up endless oratorical ammunition to right-wing critics one the airwaves, Internet and in newsprint, deploring what they call the surrender of American global leadership. These assaults often reach the point of questioning Obama's backbone. But this president with less than three years left in office seems haunted by the foreign-policy misadventure of his predecessor's invasion of Iraq. George W. Bush's ill-timed pivot from the necessary but unfinished war in Afghanistan against the 911 perpetrators not only prolonged that war but also committed this country to another quagmire from which it is not yet untangled. Throughout his presidency, Obama has been obliged to cope with the detritus of that calamity; he has also committed to ending what he has called an America "on a permanent war footing" and freeing up more resources to address pressing domestic needs. As part of this effort, he has made decisions regarding foreign-policy challenges that inevitably have cast him in hard-line commentary as soft and tentative. Unlike Bush in Iraq, Obama has moved cautiously in committing American power, especially unilaterally. In the matter of Syria's use of chemical weapons, he was on the verge of taking military action but decided first to seek congressional backing. That led to Syria's agreement to surrender its stockpile. Compliance has lagged, but Obama has persevered in this approach. In the latest crisis in Ukraine, the American recourse through Kerry's diplomatic efforts depends for a satisfactory outcome on Russian and pro-Russian Ukrainian compliance, a shaky uncertainty so far. But again Obama has opted to go the extra mile, at the risk of political injury to his own reputation, to remain in pursuit of a resolution without resort to overt military confrontation. Comparisons with Hitler's annexation of Austria or his diplomatic thievery of the Sudetenland from Czechoslovakia prior to World War II offer a provocative basis to speculate that the crisis in Ukraine could signal another world war. But cooler heads, both in the White House and Moscow, acting through diplomatic channels as well as over the contemporary version of the "hotline" that helped keep the peace during the long Cold war, remain the rational means of avoiding military catastrophe today. In the Cuban Missile Crisis of 1962, John Kennedy and Nikita Khrushchev never spoke, instead relying on sending signals through intermediaries and cables that risked misunderstanding and miscalculation. In the end, fortunately, a secret deal was struck. The other day, Putin called Obama and they talked, reportedly for an hour, and there was no report that either slammed the phone down. Diplomacy may yet be a live option, as the world waits and hopes. 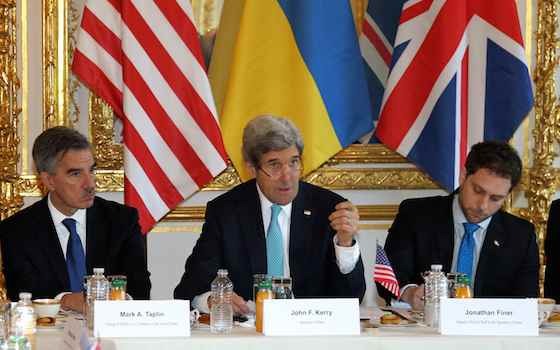 "Obama Clings to Diplomacy to Resolve Ukraine Crisis"